Scotland is unique in the place it accords to the law of heraldry and armorial bearings as a living and vibrant system. Those wanting to use their own arms in Scotland must generally apply by petition to the Lord Lyon King of Arms for a grant of arms. Those descended from a person who was entitled to use a particular set of arms and who want to use the same or similar arms must also apply for a grant and prove their descent from the original holder. Limited companies and corporations may also apply for grants of arms, with all the opportunities that arms bring to express dignified identity and discreet branding. 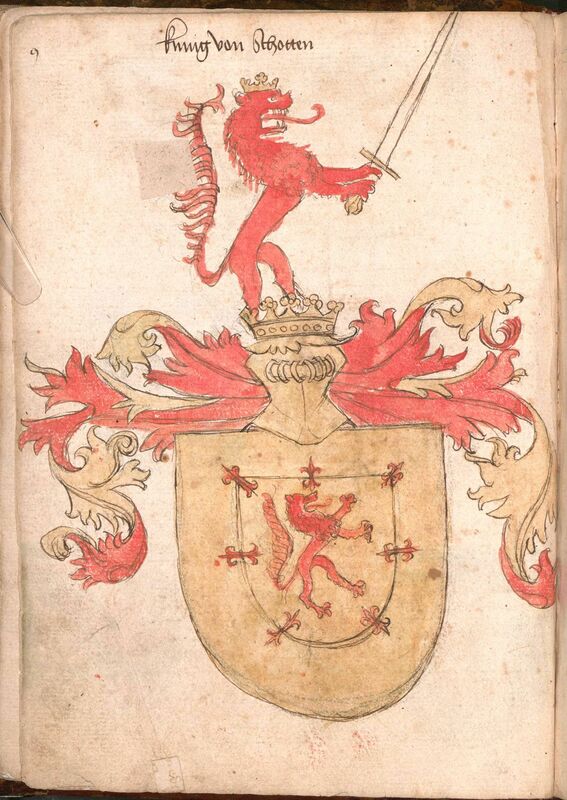 In cases where the right to hold or to succeed to a particular set of arms is disputed it is the Lord Lyon sitting as a judge who will adjudicate on the matter if it cannot be settled by agreement to Lyons satisfaction. The unique image provided by an achievement of arms provides wonderful opportunities not only for personal expression and display but may be seen as a valued investment in the image and identity of a family or company. The staff in the Lyon Office are nearly always willing to open their huge store of helpful advice to possible applicants for arms, but they cannot prepare petitions or act for applicants. from the Wernigeroder Wappenbuch, c.1475.